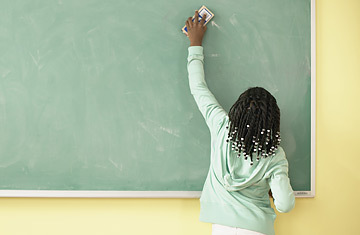 A girl erases a blackboard. Harvard professor Martin Feldstein used to tell students in his introductory economics class that economists agree on 99% of the issues in the field. From the nature of monopolies to the basic laws of inflation, Feldstein asserted, economists of all political stripes are in accord on the same principles. He claimed that what we read about in the popular press are the 1% of economic issues where the data support no clear-cut conclusion. Still, I was intrigued to read of a well-designed study released today by the Center on Education Policy that challenges decades of research on the advantages of private schools. "Contrary to popular belief, we can find no evidence that private schools actually increase student performance," said Jack Jennings, the center's president and a former staffer in the Democratic-controlled House, in a press release. "Instead, it appears that private schools simply have higher percentages of students who would perform well in any environment based on their previous performance and background." The study suggests vouchers for private schools are unnecessary because  once you control for socioeconomic status  students at private schools aren't performing any better than those at public schools. The study says that it is "the kinds of economic and resource advantages their parents can give [students]"  as well as the level of parental involvement in their kids' education that determines success or failure in high school. That's a message the teachers' unions and Democrats in general love: The problem isn't in the schools; it's with social inequality. Except that's not exactly what the data shows. It's true that controlling for socioeconomic status (SES) eliminates most of the public-school/private-school differences in achievement-test scores in math, reading, science and history. But even after you control for SES, Catholic schools run by holy orders (not those overseen by the local bishop) turned out to perform better than other schools studied. True, as the study says, there are only a small number of religious-order schools. But the data suggests that the type of school a kid attends does affect how well he will do  and that we could learn something from how holy orders run their schools. The Center on Education Policy, however, is an advocacy group for public schools, so it didn't look into why holy-order schools are succeeding where others fail. The center also downplays another finding: While controlling for SES eliminated most public school/private-school differences in achievement test scores, it did not eliminate differences in the most widely used test of developed abilities, the SAT. (As I explained more fully here, developed abilities are those nurtured through schoolwork, reading, engaging a piece of art, and any other activities that spark critical thinking. Developed abilities aren't inborn traits but honed competencies, more akin to athletic skill gained through practice rather than raw IQ. By contrast, achievement tests measure the amount of material students have committed to memory in any particular field.) Combined with high-school grades, SAT scores are the best predictor of how kids will do in their freshman year of college. And the data in the new study shows that private-school students outperform public-school students on the SAT. Isn't that just because richer private-school kids can afford to be coached more before the SAT? No  remember that this study carefully controlled for socioeconomic status. Rather, it appears private schools do more to develop students' critical-thinking abilities  not just the rote memorization required to do well on achievement tests. In short, today's study shows that sending your kid to private school  particularly one run by a holy order like the Jesuits  is still a better way to ensure that he or she will get into college. Just don't expect all education experts to agree.